A few weeks ago Kezia Scales, whose PhD topic is the person-centred care approach, and Fiona Birkbeck, who is examining client/expert relationships in the NHS and Education, and who both recently presented papers at the IMH conference, joined the successful applicants. The six chosen PhD candidates received training and advice from Mark Rawlinson, Head of the Department of Art History and Eleanor Forward of the Graduate School on how to make and explain links from their own research to art works constructed entirely from paper and displayed in The First Cut exhibition, from 29th April to 9th June, 2013. On the evening of the event, Kezia went first, standing beside her chosen work – ‘Upon the End of Your Feral Days’ by Chris Jones. 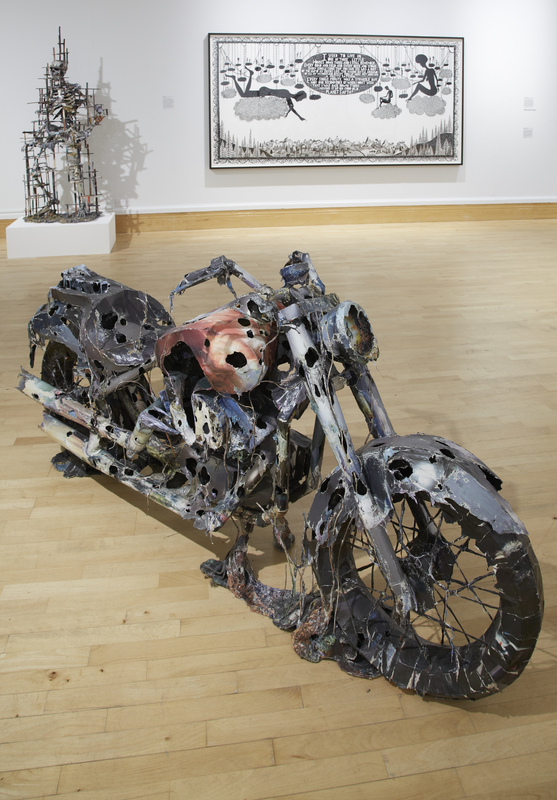 A powerful papier mache recreation of a motorbike in decay. It seemed broken and discarded, the colours murky, the shine all gone but as Kezia began to speak, the audience could see that the motor bike actually had shoots of regeneration, new life curling up from its base. As she said, ‘On first impression, this title seems to say it all. Once, this bike might have been a symbol of speed, vitality, youth, freedom, sexuality, danger, power – but now? It has reached the end of the road. With its eroding edges and gaping holes, this bike seems to signify nothing but loss and decay. Kezia went on to say that the motorbike with its memories and its still rakish stance, reminded her of a particular resident from her ethnographic research: Leo. Leo is living on a special dementia unit that is attempting to implement person-centred care. Recalling, as an example, Leo’s delight in a joke shared with a care worker as they sat in the sun together, Kezia told us that, ‘Leo clearly hasn’t reached the end of the road. He is still connecting with his environment, and the people around him – just as this static bike can stir feelings and responses in us as observers, Leo is still sharing with us his own pleasure in living.’ One care assistant has created a ‘memory book’ that shows photos of Leo in his navy uniform, but also shots of him as a husband, a father, an ordinary guy. Importantly, Kezia told us, the carer has also left blank pages so that new photos can be glued in – not from Leo’s past but from his present and his future. Just like the motorbike, Leo still retains the capability of action, of ‘effect’, his capacity for ‘feral days’ is not over, although it may have changed. I was waiting to speak after Kezia, and, as the enthusiastic clapping died away, I directed the audience to turn and look at the floor. For on it was spread the work of Andrea Mastrovito, entitled Exodus 8.13, and the subject of my paper. Although using simply cut paper as its medium, Exodus 8.13 is designed to elicit a series of complex responses from the viewer. When I first saw the vast bed of exuberant flowers spread out on the floor of the gallery, my initial response was one of delight. 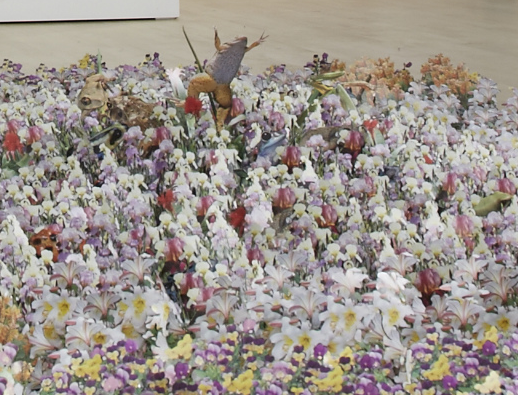 Have they planted a bed of flowers actually inside this gallery? Ah no, of course, they are paper flowers. But just after that initial response came another, more surprising, reaction. Fear. 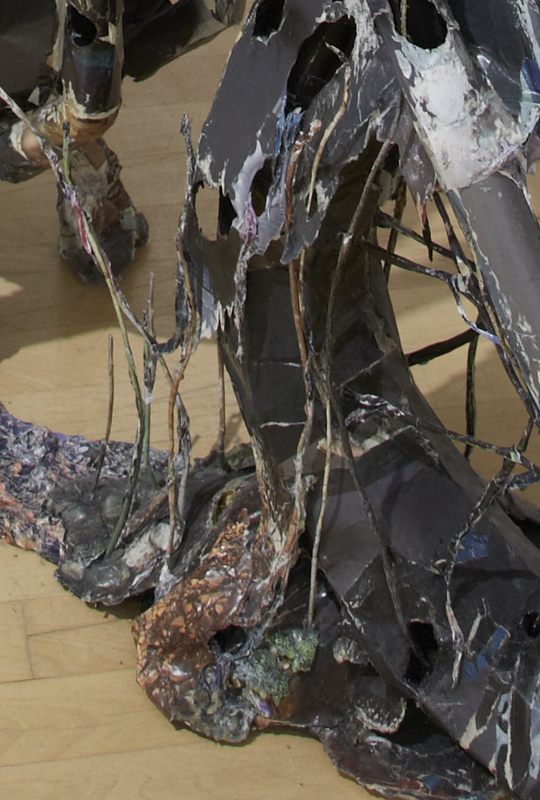 The flowers looked vulnerable, they had no protection from the feet of the gallery visitors; they were open to being examined, maybe picked over until they were destroyed. There was no sign advising us to be careful. My area of research is into our public services, particularly health and education. The Consultants, Nurse Directors, GPs, Head Teachers and Senior Lecturers whom I have interviewed tell me of their fear – their uneasiness – that our services may be ‘viewed’ and ‘picked over’ until they no longer exist in any form that we will recognize. Just as the paper frogs eat the paper flowers in the Pharaoh’s garden of Exodus 8.13, so practitioners fear that the very ethos of public service is being eaten away. League tables in schools and time targets for GPs may have unintended consequences. Our expert practitioners, who have always been keen to measure their own performance, are afraid that they are now being asked to tick the wrong boxes. 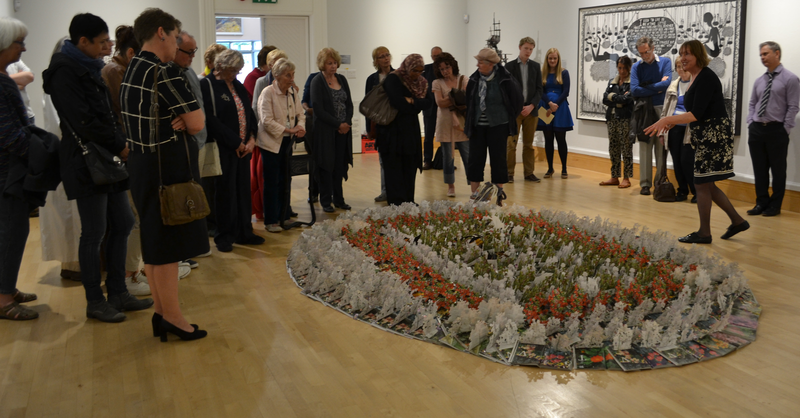 If, as a visitor to the gallery, you bend down to examine the ‘garden’ more closely, you will see that that it isn’t made of carefully crafted, hand painted flowers, as you might expect, but its illusion of bounty is taken from cheap, mass produced catalogues. Advertising made to entice us to believe that the glossy blossoms can be ours. This ironic twist in the art work echoes the comments of our doctors, nurses and teachers who tell me that glossy brochures may reflect the commodification of healing and learning in our society rather than tell the truth about the ‘products’ on offer. However, as I walked away from the ‘flowers’ on that first day, I realized that they still made a splash of thrilling, uplifting colour. The flowers, whatever connotations they carry, create a real sense of joy – just as inspirational and compassionate practitioners in heath and education still manage to offer good care and teaching, to the benefit of us all. The IMH Blog Team are pleased to announce an upcoming exhibition being held at Djanogly Art Gallery, Lakeside Arts Centre, University Park, Nottingham. The exhibition begins Saturday 7 September 2013 and will run until Sunday 3 November 2013. Admission is free. 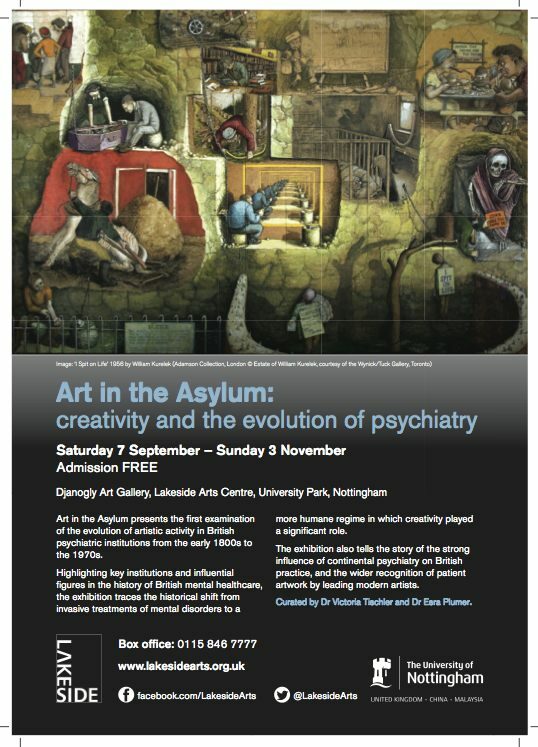 Art in the Asylum presents the first examination of the evolution of artistic activity in British psychiatric institutions from the early 1800s to the 1970s. Highlighting key institutions and influential figures in the history of British mental healthcare, the exhibition traces the historical shift from invasive treatments of mental disorders to a more humane regime in which creativity played a significant role. The exhibition also tells the story of the strong influence of continental psychiatry on British practice, and the wider recognition of patient artwork by leading modern artists. Curated by Dr Victoria Tischler and Dr Esra Plumer. One of the biggest challenges we face is our ageing population. Modern medicine and general improvements in health have resulted in many more of us living longer. There are now 1.7 million more people over the age of 65 than 25 years ago, and the number of people over the age of 85 has doubled in the same period. One consequence of increasing longevity is increased prevalence of chronic disease, not least dementia in its many forms. Currently it is estimated that some 800,000 people in the UK have dementia. The Alzheimer’s Society predicts this could be a million by 2021, more than 1.5 per cent of our total population. Summary statistics like this mask the human side of a condition that is not well understood and which has devastating consequences for those affected by dementia and those who care for them. In 2006, in partnership with the Nottinghamshire Healthcare NHS Trust, we established The Institute of Mental Health (IMH) to promote interdisciplinary research and pioneering educational activities in this key area. As well as conducting fundamental and translational research, the IMH promotes truly innovative outreach programmes. Inside Out of Mind, which is now being performed at Lakeside, our public arts centre, is a remarkable example of genuine innovation. This original theatrical production is based on findings from research commissioned by the National Institute for Health Research, and led by Professor Justine Schneider. She and her team of ethnographers provided the raw material from intensive evaluation of carers and the cared for on three dementia wards, and playwright Tanya Myers “…humanised their data into drama…” Tanya also directed Inside Out of Mind. The outcome is a strikingly powerful production: sometimes harrowing, sometimes humorous, but always sensitive and sharp in its insights on the lives of carers and cared for. It is educational, thought provoking and bursting with emotion. Unsurprisingly it is receiving a lot of attention, and in the process promoting open and welcome debate. The production is underpinned by practical and financial support of more than a dozen organisations from the public and voluntary sectors. Each has played an indispensable part in bringing this performance to the stage, enabling 1,500 health-care staff to come and see how their working lives have been dramatized by Tanya Myers and her team. The development and production of Inside Out of Mind has been an exciting journey of knowledge exchange between the arts, social sciences and health-care providers. It is our University at its very best: delivering innovation and excellence in research, working in partnership across different sectors, and building bridges between health, education, research and the wider public through the arts. For many, this project would have been just too risky: not so for Lakeside, and Shona Powell and her colleagues are to be congratulated for taking it on. Sarah Dale ~ When are we going to exceed our sell-by date? So Professor Arne Akbar, of University College London, summarised one of the key questions his research intends to answer. As Professor of Immunology, he was one member of a fascinating panel discussion at this year’s Cheltenham Science Festival. He was accompanied on stage by Dr Donald Palmer of the Royal Veterinary College and Professor Thomas von Zglinicki of Newcastle University, with Chair, Dr Suzy Lishman, Vice President of the Royal College of Pathologists. I attended this discussion on the ageing immune system expecting a physical biological slant and wondering whether I would come away with ideas about diet or exercise that I could perhaps apply. But when someone asked whether there was anything we could do to foster an effective immune system into old age, the answer was resoundingly to avoid excessive stress. Whilst other factors such as diet were important, and genes and chance played the over-riding role in how well each of us will age, stress was top of the list of damaging lifestyle factors. As I understand it, the mechanism seems to be that high levels of stress hormones lead to inflammation which leads to a lowered immunity. It may be seen in cold sores, frequent colds and ultimately many more serious illnesses especially as we get old older. It can shorten our lifespan, and lead to miserable final years. As an occupational psychologist, I am interested in stress, well-being and successful transitions, including ageing, in the working population. Many of my clients are in their forties and fifties, trying their level best to keep a successful career and family going whilst staying mentally and physically healthy. Most of them expect and hope for a long and active life. Many of them are also stressed – and see this as an inevitable aspect of a modern professional job. This presentation brought home to me more clearly than ever before the link between mental and physical health. Mental ill-health in terms of stress affects us at a cellular level. And yet, so many of us continue to live lifestyles that dismiss the idea of actively looking after our day-to-day mental health. I meet many clients who are well aware of looking after their physical health, through diet and exercise, with varying degrees of success when trying to fit this into a busy life. Most of us recognise that on-going struggle. But well-established factors relating to mental health, such as social support and connection, sleep and mindfulness, are very often swept aside as we pursue our work related goals and pass our weeks in juggling conflicting demands on our time. The research is clear. Not only can that make us feel tired and ragged, irritable and worried, it can damage our cells. The very cells whose purpose is to protect us from harm. My guess is that most of us are really not intending to do that. But somehow our prevailing culture has become one of ignoring the risks that we are running. Or worse, actively promoting behaviour that probably increases the amount of damage we are doing to those vital cells. I think one of the most exciting aspects of the world becoming ever more connected is the synergy that happens when disciplines meet, to bring different perspectives on complicated problems. None of us has the answer on our own any more (if we ever did). For me, I think that the issue of mental health at work could be one where sociologists, psychologists, economists, accountants and immunologists (to name a few) meet. Along with some designers and engineers perhaps. We probably need to invite others along too. Maybe even politicians. We need to understand how groups work, how norms of unhelpful behaviour become established and how individuals can strengthen their own resolve and habits to look after themselves, as well as help each other. We need to grapple with how organisations deal with complex demands, and how that filters down to the cellular level of their employees. We need to educate people in how to look after their daily mental health and give them permission and mechanisms to prioritise it (which many organisations don’t, whether by design or accident). We need to know how to design or influence systems to work for our best interests rather than against them. We need to pause a while and ask good questions. Collectively and individually. We need to ask ourselves whether there is a better way to do our jobs. A way that is productive, engaging, rewarding, and motivating – and which doesn’t give us an unnecessarily short sell-by date. Sarah Dale is an occupational psychologist, coach and author. Her self-help book for busy professionals, Keeping Your Spirits Up, is available on Kindle or as paperback, and her next book, Bolder and Wiser, will be published in the autumn. You can follow Sarah on twitter on @creatingfocus. Professor Nikolas Rose recently gave a talk entitled, ‘What is Mental Illness Today? Five Hard Questions’, as part of the School of Sociology and Social Policy’s Seminar Series (University of Nottingham). The video of his presentation is now available: http://youtu.be/KxI6DmbEKQg. In this talk I want to characterize the ‘territory’ of mental illness today by posing five hard questions that seem to me to represent genuine empirical, conceptual, professional and ethical dilemmas. My questions are: Is there an‘epidemic’ of mental disorder? ; Does the path to understanding mental disorder lie through the brain? ; What is the role of diagnosis and of diagnostic manuals? ; Should we seek early identification of those at risk of future mental pathology? What is the place of patients, users, survivors, consumers in the mental health system? On the basis of this discussion, I will conclude by trying to draw out some lessons for the politics of mental health today. Professor Nikolas Rose is one of our leading contemporary social scientists. Currently he is Professor of Sociology and Head of the Department of Social Science, Health and Medicine at King’s College, London. He was previously Martin White Professor of Sociology, and Director of the BIOS Centre for the Study of Bioscience, Biomedicine, Biotechnology and Society at the London School of Economics and Political Science. He is also co-PI for the EPSRC funded Centre for Synthetic Biology and Innovation (CSynBI). His most recent books are The Politics of Life Itself : Biomedicine, Power, and Subjectivity in the Twenty-First Century (Princeton, 2006); Governing The Present (with Peter Miller, Polity, 2008) and Neuro: the New Brain Sciences and the Management of the Mind (with Joelle Abi-Rached, Princeton, forthcoming, 2012). He is a longstanding member of the Editorial Board of Economy and Society, co-editor of BioSocieties: an interdisciplinary journal for social studies of the life sciences, Chair of the European Neuroscience and Society Network, and a member of numerous advisory groups including the Nuffield Council on Bioethics. Well, it finally launched, the patient feedback website that we created as part of the Patient Feedback Challenge. The evaluation section was part of a partnership with the Involvement Centre of Nottinghamshire Healthcare NHS Trust and the web design agency Numiko to build a website which can help us to collect feedback data, summarise and report on it and share the actions and learning which have resulted. Go have a look. I’m going to talk a little bit about some of the thinking behind our approach on the Patient Feedback Challenge. Similar thinking has motivated recent developments within Nottinghamshire Healthcare NHS Trust as well as in the wider NHS but there is a long way to go before the whole NHS nationally embodies the approach being advocated here. NHS data systems are, quite naturally, built around very strict data management which emphasise the security of data and ensuring accountability of data loss or misuse. This is right and proper. However, very frequently, clinicians, managers, auditors and evaluators do not need to access highly sensitive personal information. In certain cases, information can be shared freely over the internet, as with the data collected on patient experience within the Patient Feedback Challenge (survey responses, Patient Opinion stories, and specific extracts from the PALS database). The skills and technologies to rapidly analyse and disseminate data of this kind where rights access is not an issue is presently lacking in many NHS settings. Data analytic solutions, where they exist, are often large and complex and are complex and expensive to set up and modify. Where solutions are brought in from private sector providers these tend to be inflexible and it can be difficult for an organisation to achieve the results they want using off the shelf technologies (for example, integrating and resharing different types of data, such as the survey, Patient Opinion, and PALS data involved within the Patient Feedback Challenge). A limitation in the data architecture of many NHS organisations is the tendency for data to exist in silos, with each department maintaining its own separate database with no capacity to combine or reshare any of the data. Often the existence and location of datasets is unknown to others working elsewhere in a Trust. The process of analysing and presenting Service User and Carer Experience survey data began in a similar fashion, with spreadsheets and macros being used to produce summary graphics, and reports manually cut and pasted together. Fortunately for us, before we lost 2 billion dollars this way there was a mishap and it became obvious that the process needed to be automated in order to meet the reporting timescales. An incremental approach was adopted, and each stage of automation brought more complex and better data summaries, so that within a few years reporting on survey data had gone from a task that was difficult for one person to perform quarterly alongside other tasks to a level of complexity that would demand more than one individual working full-time for the whole of each quarter just to meet each quarterly timescale. The patient feedback challenge has allowed us (with our friends at Numiko) to clear the final hurdle and to remove the last vestiges of human effort from the regular reporting, which means that quarterly survey reports and custom extracts will be available 24 hours a day, 365 days a year to anyone in the world with an internet connection. Managers will be able to see the latest results from their area and anywhere else in the Trust at any point in the reporting cycle and service users and carers will be able to transparently query and scrutinise all of the patient feedback data that we collect. All the technologies that were used are simple, free, and open source. Using free software such as R and reporting technologies such as HTML and LaTeX means that not only are there no costs associated with buying or licensing software but also that analysis and reporting technologies are simple to use straight away. In a process known as agile software development (Beck et al., 2001) all of the technologies that have been produced have been put to immediate use. Early on, automation was only possible of graphics and manual effort was required to put together the report and write textual summaries. Later graphics and text were both automated and only formatting and final edits were performed by a human being. With the completion of the Patient Feedback Challenge now the formatting can also be automated. But at each stage the results of the technology were being used live in order to meet the demands of the organisation. This has the twin benefit of giving an immediate payoff to investment in workforce costs developing the software as well as giving the opportunity for the technology to be refined in use. The results of each stage of development were obvious when each reporting cycle was complete and work has been undertaken throughout to better serve both the Involvement team who deliver the survey results as well as the clinicians, managers, service users, and carers who make use of them. There were two bits of coding work that made up the majority of my contribution, the quarterly report function which summarises feedback at all levels of the organisation in a series of hyperlinked webpages and the custom search function which uses the very simple Shiny package to allow users to query different types of data and search by service type, demographic feature, keyword, etc. The code for both can be found at my GitHub page. One of this week’s blogs is a repost from the wonderful Centre for Mental Health. The original blog was here, on the CMH’s own blog, by Chief Executive Sean Duggan. His post examines the current changes taking place in the NHS, and the potential positive impact on mental health services. As clinical commissioning groups and NHS England take on their new responsibilities for real, the NHS mandate has become the key to ensuring that the new NHS commissioners make progress against the Government’s priorities for better healthcare in England. The mandate provides the vital link between the NHS and the public nationally, setting out what NHS England in particular will be accountable to the secretary of state (and Parliament) for achieving over the next two to three years. As a briefing paper published by Centre for Mental Health this month shows, the objectives set out in the mandate cannot be achieved without a major focus on mental health for people of all ages throughout the NHS. Following the government’s pledge to work towards “parity of esteem” between physical and mental health, the mandate includes a far larger number of commitments to improving mental health support than any of the operating frameworks that were its nearest equivalent in previous years. These include the expectation that NHS England and CCGs will continue to make progress on improving access to psychological therapies, not just for working age adults with depression but for children, older adults, people with long-term physical conditions and those with severe mental illness. The mandate requires the NHS to make progress in securing employment for more people with mental health conditions and to offer more personalised support to people in mental health services, including through the use of personal health budgets. It also seeks to ensure the service looks beyond its conventional boundaries, for example to work with colleagues in public health to improve support for young families and to continue the nationwide expansion of liaison and diversion services in police stations and courts. It sets some important new challenges to NHS England in improving access to mental health care and bringing greater parity to waiting times. This will take action on several fronts, from speeding up access to care in a crisis to bringing down waiting times for psychological therapies and other forms of mental health support. Many of the objectives of the mandate require mental and physical health support to be far better integrated. From improving maternal mental health to taking action to address the 15-year mortality gap for people with a severe mental illness, the artificial separation of mental and physical healthcare will need to be addressed throughout the NHS. Nowhere in the 21st century NHS should a person’s mental health needs be neglected or professionals lack confidence in dealing with a patient’s emotional or psychological needs. The mandate will not on its own bring about parity between mental and physical health in the NHS. It is in the everyday actions of commissioners and providers at every level of service that the separation and inequality between the two will be tackled most effectively. It will require local commissioners to look at where they invest scarce resources to get best effect. It will require continued action to collect robust and useful outcomes data both for mental health services and for people with co-morbidity conditions. And it will require concerted leadership and sustained commitment from NHS England and CCG boards to challenge existing ways of working that stand in the way of parity and integration.